Co. Kildare: Balraheen, Celbridge (2), Cloncurry, Donadea, Donaghcumper, Kilcock (2), Leixlip, Maynooth (2), Straffan. Co. Dublin Clonsilla, Lucan (2), Newcastle, Rathcole, Saggard. The Board also included 6 ex-officio Guardians, making a total of 25. The population falling within the Union at the 1831 census had been 26,197 with Divisions ranging in size from Clonsilla (population 918) to Lucan (2,723), Maynooth (2,639) and Celbridge itself (2,547). 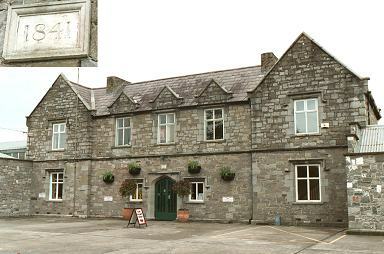 The new Celbridge Union workhouse was erected in 1840-41 on a five-acre site on Big Lane (now Maynooth Road) at the north of Celbridge. Designed by the Poor Law Commissioners' architect George Wilkinson, the building was based on one of his standard plans to accommodate 400 inmates. Its construction cost £4,600 plus £900 for fittings etc. The site location and layout are shown on the 1911 map below. 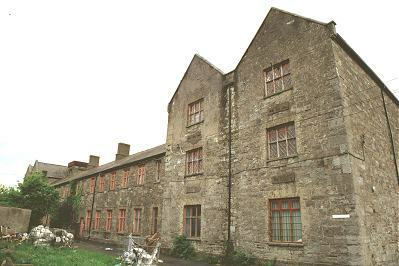 The workhouse was declared fit for the reception of paupers on 26th May, 1841, and received its first admissions on 9th June. The workhouse had a two-storey entrance and administrative block facing to the road at the west. On the first floor was the board room where the Guardians met at 11am on Friday each week. At the rear of the entrance block were the boys' yard at the north, and girls' yard at the south. Behind these stood main accommodation block with the Master's quarters placed at the centre. The north end contained girls' school rooms and dormitories in the two-storey central portion, with aged women's accommodation in the three-storey cross-wing. The south send provided similar facilities for boys and aged men. A single-story block immediately to the rear contained a wash-house and laundry on the women's side, and kitchens on the men's side. A two-storey central spine containing the dining-hall and chapel led to the infirmary and idiots' wards at the rear. 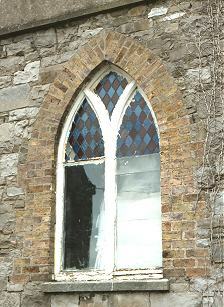 The chapel is marked out by its simple stained-glass windows. A fever hospital and mortuary were located at the south of the workhouse. 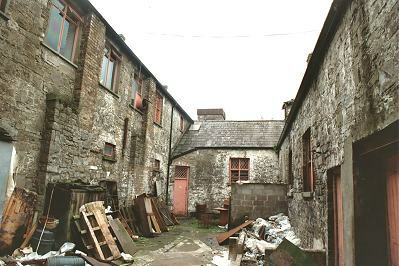 During the famine years in the mid-1840s, conditions in the workhouse were appalling. Overcrowding was severe and most of the inmates were sick. Fever patients lay naked on straw, with the living and dead next to one another. Sickness amongst doctors often meant that care was in the hands of pauper nurses who had no training or knowledge of hygiene. In 1847, an official report found that a death was taking place every hour. In October 1921, the workhouse was occupied by the Irish Republican Army, although bout 60 patients continued to be accommodated in the workhouse hospital. The casual ward was converted into a guard room. The hospital block was subsequently burned down. The former workhouse site is now occupied by a paint manufacturing company. The former workhouse/famine graveyard was renovated in 2006-7 and a service of remembrance was there held on 4th November 2007. 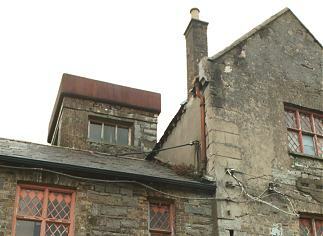 For more information on the project see the Celbridge Tidy Towns web-site. Kildare County Library, Riverbank Campus, Main Street, Newbridge, Co. Kildare. Holdings include Board of Guardians' minutes (1914-20) etc. Doohan, Tony (c.1980) A History of Celbridge.